Prayer Vigil for the Nine Victims of the Charleston Shooting. On June 17, 2015, a white supremacist walked into a predominantly black church in Charleston, South Carolina. That evening, a small group of black men and women had gathered at the historic Emanuel African Methodist Episcopal (A.M.E.) Church for bible study—unaware of the sinister motives of the new visitor in their midst. After an hour of discussion and prayer, then 21-year-old Dylann Roof stood up and calmly announced, “I’m here to kill black people,” before opening fire on the unsuspecting group of parishioners. Within minutes, Roof took the lives of nine black men and women: Sharonda Coleman-Singleton, Cynthia Hurd, Susie Jackson, Ethel Lance, Depayne Middleton-Doctor, Rev. Clementa Pinckney, Tywanza Sanders, Daniel Simmons, and Myra Thompson. He forever shattered the lives of countless more. The massacre would go down in history as one of the most horrific acts of racial violence in recent memory. Immediately after the shooting in June 2015, I collaborated with fellow historians Chad Williams and Kidada Williams to launch the #CharlestonSyllabus, a Twitter movement and crowdsourced list of reading recommendations on the history of racial violence in the United States. With the public reading list we created and the subsequent book, we hoped to do more than simply provide an opening for yet another national conversation on race. Instead, we wanted to offer valuable resources that would provide the necessary historical context for understanding the massacre—a context that was clearly missing from public discourse surrounding the shooting. The Charleston massacre opened the eyes of many Americans to the persistence of racial violence in this country and many vowed to work toward its end. Yet, as we approach the two-year anniversary of the Charleston massacre, racial violence continues to plague our society. In the two years since the massacre, we have witnessed an unprecedented rise in racist acts of violence across the country. The Charleston massacre, though tragic, was not the first act of racist violence in the United States. Black men and women in this country have been subjected to this kind of violence and terror for centuries. Significantly, the church where the massacre took place has strong ties to slavery in the United States—it was the site of Denmark Vesey’s planned revolt against slavery almost two hundred years ago. In 1822, a group of white men burned down the predecessor of the Emanuel AME Church, located only a few blocks away from the current-day location in Charleston. These acts of racist violence that took place in black communities during the nineteenth century extended well into the twentieth and twenty-first centuries. Because of the central role they play in black communities—as sanctuaries for education and political organizing, for example—places of worship are often the first to be targeted by white supremacists. Perhaps the most well-known act of racial violence took place in 1963 at the 16th Street Baptist Church in Birmingham, a central meeting place for civil rights leaders who were attempting to register local black residents to vote. During a service on Sunday, September 15, 1963, white supremacists planted a bomb at the Birmingham church, killing four black girls—Denise McNair, Addie Mae Collins, Carole Robertson, and Cynthia Wesley—and injuring twenty-three others. 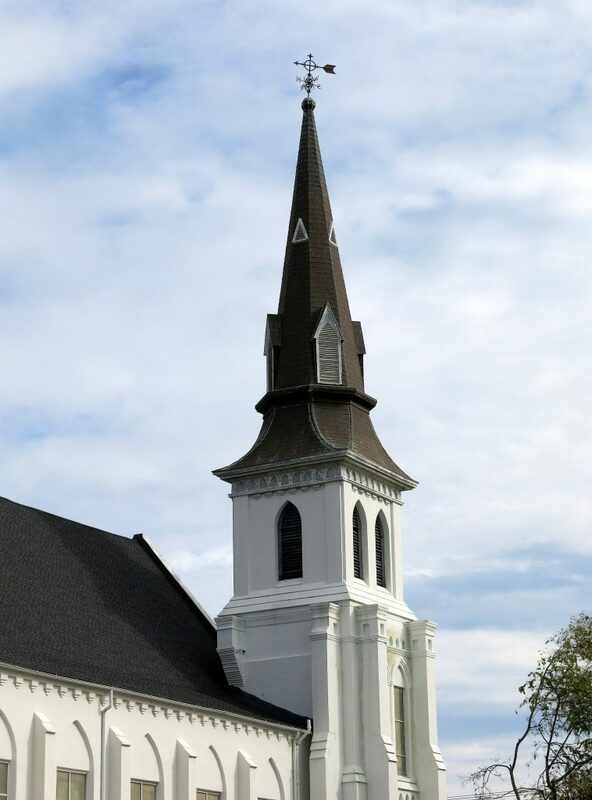 The steeple of Emanuel African Methodist Church, Charleston, SC. Photo: Spencer Means/Flickr. Many evoked the 16th Street Baptist Church bombing during the wave of burnings at Southern black churches in the 1990s. Similarly, many evoked the 16th Street Baptist Church bombing in the wake of Charleston. The links between the 1822 white supremacist attack on the Emanuel AME Church in Charleston, the 1963 Birmingham Church bombing, and the 2015 Charleston shooting underscore a continuum of racist violence in the United States. Violence, terror, and hate remain deeply ingrained in US culture and society. Racial violence is not solely a thing of our past but also of our present. Two years after the Charleston massacre, acts of racial violence remain rampant in American society. In the days following the election of Donald Trump, the Southern Poverty Law Center reported receiving more than 200 complaints of hate crimes. Within the last few months alone several incidents have captured news headlines, bringing the issues of racism and racial violence to the fore. In March 2017, a white supremacist from Baltimore stabbed Timothy Caughman, a 66-year-old black man, to death on a public street corner in New York City. The murderer had traveled to New York City from Baltimore with the explicit intention of killing black men. More recently, a white supremacist was arrested for the stabbing death of Richard Collins III, a black Bowie State student who was recently commissioned U.S. Army second lieutenant. Equally troubling are the recent appearance of nooses at the African American History Museum, American University, and other public sites in the nation’s capital—another attempt to terrorize black men and women by evoking the sordid history of lynching in the United States. 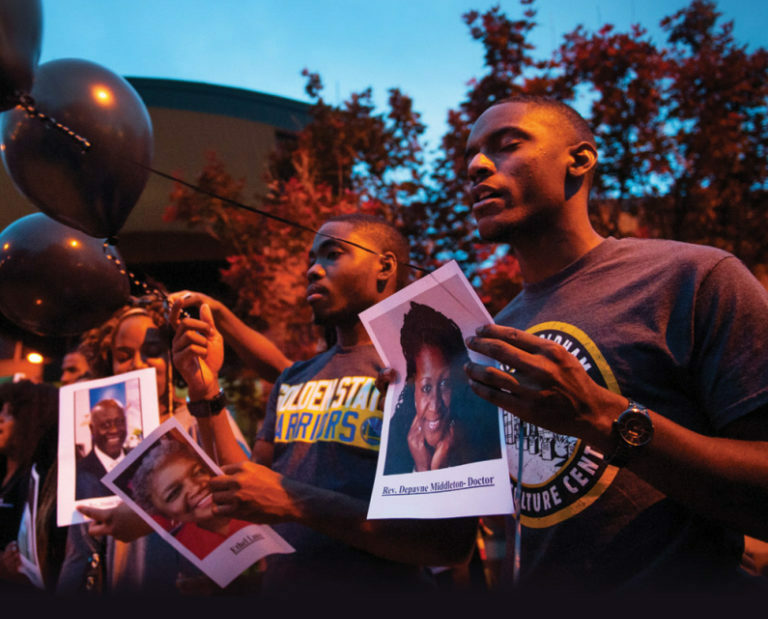 What all of these events reveal is that we are still living in the shadow of Charleston. The anniversary of the massacre invites us to reflect on this tragic incident in our nation’s history—but it should not end there. The anniversary of the massacre provides a unique opportunity for us to confront both the unsettling history and current reality of racism and racial violence in the United States. Honoring the memory of those who died at the Emanuel AME Church requires acknowledging the unbreakable ties between past and present, the persistence of racial violence, and the stagnancy of race relations in the United States. Keisha N. Blain is a historian of the 20th century United States with broad interdisciplinary interests and specializations in African American History, the modern African Diaspora, and Women’s and Gender Studies. She is the author of Set the World on Fire: Black Nationalist Women and the Global Struggle for Freedom (University of Pennsylvania Press, 2018). Follow her on Twitter @KeishaBlain. Another great piece by Keisha N. Blain. I like how the article does not just talk about the victims of racially-instigated violence in general, but actually mentions the victims of such deplorable acts by name. For they are people and not just numbers. Looking forward to your forthcoming book: ‘Set the World on Fire: Black Nationalist Women and the Global Struggle for Freedom’ (University of Pennsylvania Press).